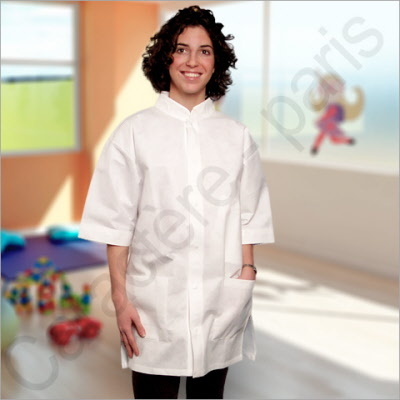 Set of 30 disposable and versatile white Work Coats, also known as Work Tunics and Work Smocks depending on the profession, which can be washed and reused at least once. This high quality work coat can be used for a week's worth of work, then discarded or recycled, which prevents the need for time and labour intensive bleaching, washing and drying traditional work coats. The material is soft and breathable, so the coats feel fresh and light even in the warmest environments (i.e. salons, hair parlours and tanning beds). The durable non-woven material can be washed once, but is not intended to be washed several times. Economic and beautiful all in one, these gowns are ideal for salons, massage, hair and beauty parlours, where workers must handle oils and other products that stain cloth materials easily. The package includes 30 disposable work coats.